Chethan was unable to open his mouth since birth and it became apparent to the family as a serious issue when he was three years old. Till then he was being fed only milk. He lived on small pieces of bun being pushed into his mouth along with milk or coffee. He only weighed 27 kg till 23 years of age. He would snore very loudly and would face breathing problems. His father was concerned if he would live through it. He invariably slept in a sitting position. Chethan attended school and used to perform well. The teasing and bullying he underwent would make him question himself.His classmates teased him for his appearance and speech because of which he felt embarrassed and stopped attending school. His only aspiration in life was to breathe normally. He started performing badly in school due to his disturbed sleep and inability to breathe which had manifested as a bulge in his chest. He was fluent in Kannada, Hindi and English until his physical and psychological issues pushed him to a corner and by 9th standard he stopped reading. He is a fan of cricket and watches it on TV along with WWFwrestling. He comes from a family of 4 children , a girl and a boy elder to him, who are already married, and a younger brother who goes to work. Every time the family would sit together to eat, he would cry as he would be the only one who couldn’t eat normally. At the age of 20 years, Chethan had very high fever, along with breathing difficulties. Seeing him in this condition the father wondered that it would have been better if he had not lived at all. The parents had consulted a few specialists over the first 20 years and were always told that he needs surgery which would cost between Rs.5-10 Lakh and there was no guarantee of a successful surgery. He and his father had gone to Chinmaya Mission Hospital to see a family member and at the same time INGA Health Foundation was performing surgery at the hospital. One of the team members of INGA Health Foundation spotted him and spoke to his father about getting Chethan treated successfully free of cost. Chethan’s father and Chethan both agreed to have the surgery done. Every time Chethan was admitted and underwent the surgery, his father would inform the family that he had a successful surgery only after he was shifted to the ward because of the fear that it is a risky operation. 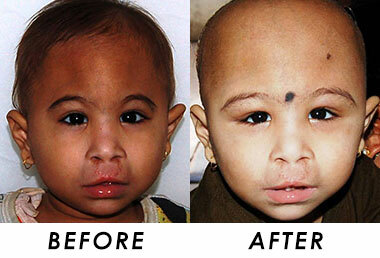 Chethan underwent a series of surgeries over a period a one and a half year. His surgeries were successful and he no longer snores or has difficulty in breathing any more. His heart also has reverted back to normal size. His father has enrolled him to write his 10th standard exams in April 2017 after which Chethan hopes to get a job in Bangalore. Now, Chethan participates in the household works and is now able to lift weights and do physical work and now weighs 33kg. He now helps his father who works as a coolie and grows a little Millet on his one acre land when the rain is good. Chethan’s father’s said, if God exists it is INGA Health Foundation and its team of doctors who changed, not only Chethan’s but also their lives. The entire family is very content today and see a brighter future in the years to come. 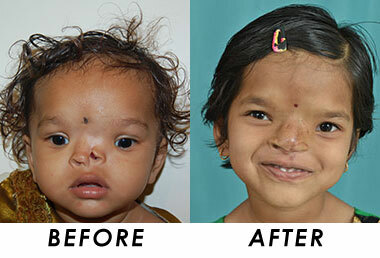 Tujanna Sai was born with Agenesis in her left nostril. This meant that she had a normal right nostril and an inadequate left part of the nose. The condition distressed her parents; in pre-school, their child would be teased. Besides, the parents were embarrassed taking her to social gatherings. Tujanna Sai was first operated when she was a year old. The parents approached INGA Health Foundation in May 2011 and their child underwent her first operation soon thereafter followed by a final operation in July 2016. The initial operations proved traumatic for the parents as the final results were not apparent. Following the completion of all stages, Tujanna Sai looks like any other child, bringing relief to her parents. She is attending school, performing well and no longer considered a burden. Gangamma is a 17 year old girl who presented to us with a condition of Bilateral Temperomandibular Joint Ankylosis. This is a condition where the joint that helps in opening the mouth is fused to the base of the skull on both sides. This causes complete inability to open her mouth since birth. As the growth centre of the lower jaw, is located in the joint region, there is retardation of mandibular growth, leading to severe breathing anomaly called Obstructive sleep apnea. (A condition, which reduces the life span by affecting the heart and the lungs). Gangamma underwent 2 staged procedure, where in,her jaws were grown to normal size using a technique called Distraction Osteogenesis, and later on, the fused joints were released to allow her to open her mouth normally. She has no breathing difficulties currently, and can eat normally. Today she is active, confident and esthetically pleasing to look at. Anish is a 2 and half years old boy from Nepal, who presented with a triangular shaped skull in the forehead region (Trigonocephaly). 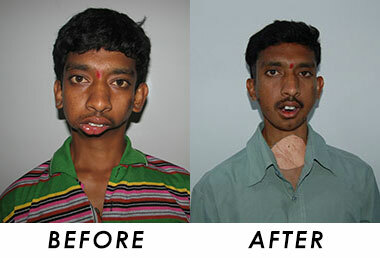 He was referred to our centre in Bangalore as treatment for his condition was not available in his country. At that time he was 1year 10 months old. The triangular shape that you see is the only part of the child’s brain, which has grown normally. On either side of the triangle, the head appears squashed. This means that the brain on either side of the triangle is severely compressed and under pressure. In medical terms, the compressed portion of the brain is called the Frontal Lobe. This is that part of the brain which gives an individual his intelligence and alert activity. Anish had a significant delay in his developmental milestones, which is an early sign of brain compression and decreasing intellect. Anish underwent a complex surgery, which involved recontouring his bones of the forehead and create space for the compressed brain to expand and grow. 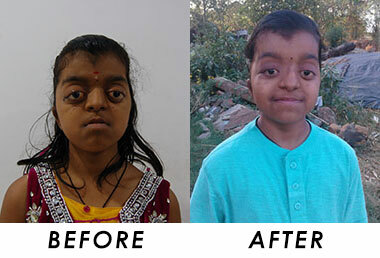 Within 6 months after the surgery, Anish demonstrated a lot of improvement in attaining the milestones. His long-term prognosis is excellent, and he is likely to grow and develop as a normal child. 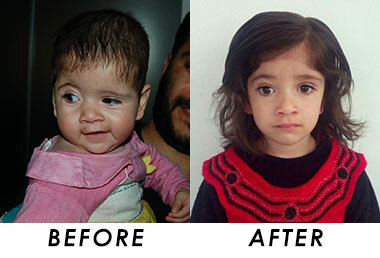 Suma is a 10 year old girl who presented to us with a condition called Cruzon's Syndrome, Cruzon's is a condition with multiple craniosynostosis (premature fusion of the sutures in the skull which does not allow the face and brain to grow normally), as a result of this she had developed severe hypoplasiaof the skull and midface leading to protrusion of the eyeball out of the socket (Exorbitism). Prior to her surgery, Suma was unable to close her eyes, which led to frequent redness and infection. As her mid face was severely deficient, she had excessive snoring and was unable to breathe normally, which therefore led to frequent episodes of disturbed sleep. Due to the compression of her brain, Suma was a shy and an introvert child, slow in her responses with her day to day activities including her fine motor skills. Today she is active, confident and esthetically pleasant to look at. Tazayun is a child from Kashmir who was born with a flat skull (Plagiocephaly), which restricted his normal growth of his brain. He had a major surgery to recontour his skull under the expert care of Dr Krishna Rao and his team in Bangalore, This will create space for his brain to grow. His eyeballs are now leveled and he looks aesthetically pleasing as well. Tazayun was less playful before the surgery and the frontal lobe was compressed, so there was a lot of intracranial pressure, which would lead to severe complications. Now we see a great improvement in his growth and intellect.